About the book The book is drafted keeping in mind the needs of Banking professionals preparing for Certificate course in foreign exchange (“ccfe”) conducted by the Indian Institute of Banking and finance (IIBF), chartered accountants and company secretaries. This book specifically deals with foreign exchange matters. It aims to provide clarity on fundamentals of foreign exchange laws under foreign exchange management Act, 1999 (“FEMA”) and allied laws. 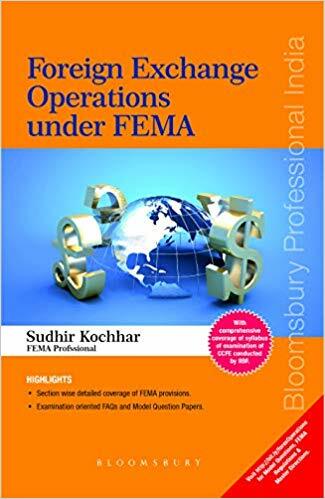 It covers complex concepts in a concise manner and covers all the important areas under FEMA operations. The book would also be immensely helpful to bankers at all stages of their carrier and other professionals in grasping the foreign exchange matters quickly. The book would also be helpful for management courses in international business. Key highlights comprehensive coverage of the following key fundamentals of foreign exchange operations: – provisions of FEMA and fcra. – Basic concept of letter of credit and other documents used in export and import. – FEDAI rules. – Fundamentals in exchange rate and its mechanism in India. – capital account transactions – ecb, FDI, Odisha and Lo/beyond/PO. – forward contracts. – non-residents. – summary of foreign Trade policy 2015–20. – lrs and Miscellaneous remittances. – foreign currency accounts. – export finance – pcfc. – merchanting trade. Various concepts are explained using diagrams and tables. Section wise explanation of various provisions of FEMA and allied law. 200+ ccfe examination oriented MCQs for practice. 7 Model Question Papers covering 300+ MCQs for ccfe examination. 250+ fans addressing various FEMA issues. Url providing further model questions, FEMA regulations, master directions and selected important AP dir circulars. About the.